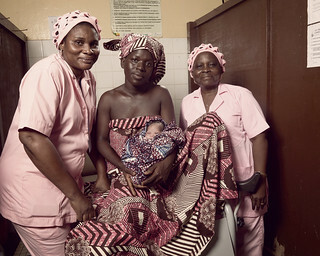 Blanche Waouwa (right), 41, and Pulchérie Oza (left), 57, are midwives at a hospital in the Lokossa commune of southwest Benin, 200 kilometers from the capital, Cotonou. The hospital’s dilapidated facilities handle birth after birth: Benin’s fertility rate was 4.8 children per woman in 2013. Gynecologist Solange Houedjissin heads the obstetrics department at the hospital, which receives subsidies tied to the quality and quantity of services delivered to patients. “Pregnant women often come here in terrible shape, because so many of them have no sense of the importance of prenatal care,” she says. “And it’s important to educate them about the fact that when there are complications, a caesarean is not inevitable  some women flatly refuse to get into the ambulance to go to the hospital,” she adds. Since 2009, caesareans have been free in Benin, but some hospitals try to make patients pay CFAF 30,000 to 50,000 for “incidental expenses.” The rate of childbirth by caesarean in this hospital is 27.8 percent (554 out of 1,989 births).